I know. I know. This was supposed to go up on Monday. I really needed to take a break from all extra curricular activities though, and tend to a few things closer to home. I also had a hard time figuring out what to post about. I kinda wanted to do something Halloween inspired, but it is getting a little late for that. So instead I decided on something useful for your kitchen. I had some cloths Pins left over from the last tutorial so I decided to make some magnets. Sorry for repeating cloths pins, but they are easy and cute. So here it goes. 1. Trace with a very sharp pencil around cloths pin, and cut out. 2. Spread layer of Mod Podge directly onto cloths Pin. 3. Place strip of paper over Mod Podge. 4. Spread a second layer of Mod Podge over paper. Let dry 15-20 minutes. 5. Glue magnets onto back of cloths pin. Let dry 15-20 minutes. All done! I'm giving away a set of 5 magnets! So leave a comment (make sure to leave your name) here before Wednesday Oct. 29th. Check back on the 30th to see if you have won. These are absolutely adorable! So simple and so cute! I would love to win some of these for my refrigerator! Thanks for the giveaway! By the way, just click on my name "Sarah" and it will take you to my blog (just in case I win). I'll be crossing my fingers. Very easy and useful! i could always use more clips on my fridge! So cute! I love these Bailey. 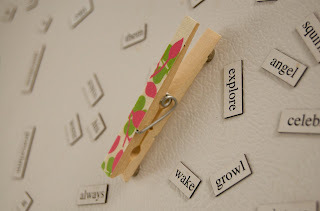 I would love them, then maybe I could throw away some of my older/junkier magnets! Cute Magnets! Sign me up! And Islay too! I had a quick question and I'm sure this is going to sound so stupid. I went to the store to buy the materials to make these. I didn't see anything called "craft magnets". I was at JoAnn's. They had magnets, but they were long strips of them. They had some circle magnets, but they would be too big for the back side. So, should I just try another place like Michael's? I mean, will the package actually say "craft magnets"? Sarah I got my magnets at at Hobby Lobby and on the package it actually says craft magnets. I'm sure they would have them at Micheal's too. They were back by the wood crafts. I hope that helps!